The history of Harrods, London’s most famous department store, is important in the development of the early vintage wristwatch. We have a large library of archived advertising material, running right through from the early 20th century to the 1990s and the first mention of the commercial sale of wristwatches for male use in the UK that we possess is in a Harrods advert from 1906 that was placed in a London newspaper. 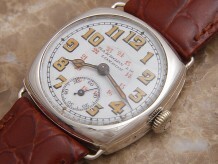 This is very interesting, as the generally accepted view among collectors has always been that the concept of the wristwatch as an acceptable timepiece for gentlemen only found favour with the general public during World War I.
Harrods was never a manufacturer of watches and instead purchased these from a number of importers, ordering them with its name printed on their dials. It is important to appreciate that while Harrods today has become rather commercialised and caters to a wide cross section of the public, in the years before World War II it was far more exclusive and very much a supplier of highly priced luxury items to London’s social elite. Harrods had forged a reputation as a purveyor of the high quality and exotic, and it couldn’t afford to have this aura tarnished by putting its signature on anything that wasn’t absolutely first rate. We’ve had quite a number of Harrods vintage watches through our hands over the last twenty five years and without exception, the quality of their movements and cases has been directly comparable to those of Rolex, Omega and the rest. It is especially fascinating to note that Harrods often claimed in its early publicity that it had a direct hand in the testing and evaluation of each watch prior to sale. This seems unlikely, as its business was as a retailer of luxury goods, not as a working jeweller or horological regulator. A perfect illustrative example is seen in the November 1916 advert for the Harrods Aquatic watch, where the copy reads “This watch is genuinely waterproof: Harrods have submitted the Aquatic to months of continuous immersion in water without its showing the slightest deterioration. Harrods test every Aquatic watch in water for 14 days before placing it on sale….etc”. In times long before eagle eyed trading standards departments, it may well be that this was simply an advertising puff, but it is difficult to believe that a concern that placed so much value on integrity would bend the truth, and in fact, Harrods at this time may have had much more hands on input in the preparation of its watches that we had previously believed. It is particularly noticeable in early Harrods advertising that its wristwatches were aimed at the military buyer. Based in Brompton Road, Knightsbridge, one of London’s most exclusive areas, Harrods was noted for its very progressive approach and would have been well aware of the demand for wristwatches from officers serving in the trenches of France long before the idea of a wrist worn timepiece for men was accepted by the average provincial jeweller. It stands out that Harrods offered waterproof Borgel cased watches, built to withstand frontline use and advertised as “visible during combat at night”, when promotional material of the time from other retailers still focused largely on ladies’ decorative models. When they were new, Harrods own watches typically sold for slightly less than their Rolex or Omega equivalents, but the price difference was smaller than we might expect. Harrods was a major London stockist for all the top tier Swiss brands and one of a relatively small number of London retailers for which Rolex, Omega, Longines and Jaeger LeCoultre would double sign dials, printing the Harrods name alongside their own. Certainly, assessing the quality of both today on a side to side basis, what are now to be regarded as vintage watches by Harrods were direct alternatives to the products of these famous houses when sold in the first instance. We can see this in the Harrods catalogue of 1929, where a selection of Harrods own wristwatches in silver are offered at £5 pounds 10 shillings each, making them just 5 shilling cheaper than a gentleman’s octagonal Rolex Oyster in silver advertised at £5 pounds 15 shillings on the same page. Anyone considering a vintage watch retailed under the Harrods name would be best advised to purchase a piece that was manufactured pre-war. There isn’t actually anything at all wrong with the watches sold by Harrods in the 1950s and ‘60s, but they tend to be less appealing in design and rather more generic than their superb earlier relations. Perhaps mirroring the changes at Harrods in general, in the 1980s and ‘90s, the temptation to put the Harrods name on large volumes of battery powered quartz watches became irresistible. These items were sold at a relatively modest price to everyone from aspiring yuppies through to passing Japanese tourists and were no longer credible alternatives to those by the famous name brands to be found in Harrods’ watch rooms. Harrods played an important role in the popularisation of the wristwatch and was a very early adopter of the idea of a wrist worn timepiece for gentlemen. Quantification of the company’s influence on the British public is difficult, but it seems clear that that there was a generally held view that if a product or type of product was offered by Harrods, then it was regarded by the populace at large as both desirable and prestigious. A well preserved Borgel or semi-hunter model from World War I that was sold new by Harrods would be a delightful addition to any serious collection that aimed to chart the history of the luxury wristwatch in the UK. The Harrods watches for sale on this site are the very best available early examples, from the years when the shop was regarded with awe by the London public at large and much beloved by the aristocratic and very wealthy. While they aren’t inexpensive, they do offer considerable savings over their counterparts by the famous brands and represent extremely good value for money. Anyone who purchases an immaculate pre-war vintage watch retailed and signed by Harrods will have an extremely high grade timepiece that can stand direct comparison to the best of its era, but they won’t have paid a great deal for it. At the time of writing, for typically £600 or £700 GB pounds, a superbly preserved Harrods vintage watch can be bought that would carry a price tag of perhaps three or four times the same sum if it was by Rolex or one of the other major Swiss houses. Very much an item for museum display, this is a rare surviving example of the very first wristwatches ever made for use by officers in the trenches of World War I. Sold by Harrods in London, this is a very high quality and historically important item. An immaculately preserved cushion shaped model, supplied by Harrods of Knightsbridge, London. Beautifully finished both internally and externally, with an eye-catching 24 hour dial scale. Representative of luxury watch design from this period and a charming find. Supplied by Harrods of Knightsbridge London, this is the perfect example of an art deco 1930s vintage wristwatch by Jaeger LeCoultre. Not easy to find in this immaculate condition, this is an attractive model for the purist collector.